Happy Monday guys! So I wanted to share a really simple and delicious recipe with you guys today and the best part is it healthy and fast, my favourite two combinations. As a mom to two little boys it can be hard to get a warm meal in while taking care of them. 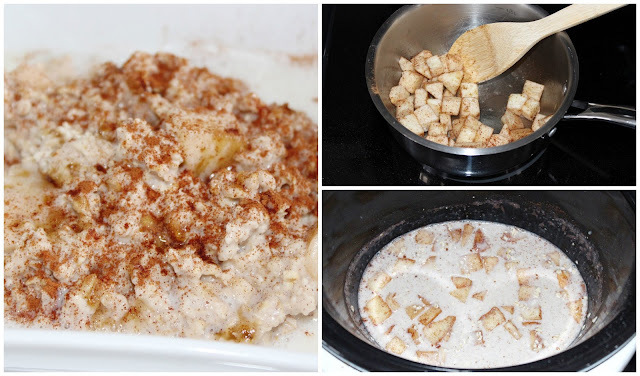 This slow cooker apple cinnamon oatmeal is one of my go to's and is so tasty. I love that I can just throw everything in the slow cooker and have a nice warm meal that I can enjoy while the boys are having their morning play. Or you can be a real keener and throw it all in the night before and it will be ready for you when you wake up! First dice up the apples into small squares, you can leave the skin on or off. Next you want to pop them into a pan on medium heat with the coconut oil, a pinch of cinnamon & brown sugar. You just want to soften the apples so only about 5 min or so. I have to say this combination in the pan smells amazzzzzzing and will have your kitchen smelling great in no time. Next you want to dump your oats, almond milk, tbsps of brown sugar & tsp of cinnamon into the slow cooker and give it a good stir. Then toss your softened apples in, put the lid on and cook it on high for about 45-1hr. The longer the oats sit the thicker they get so I usually turn it onto warm after about 45 minutes. It's a great meal for the whole family and you can alter the measurements to make a bigger or smaller batch. I love leaving it on warm for a few hours and having some for lunch as well. 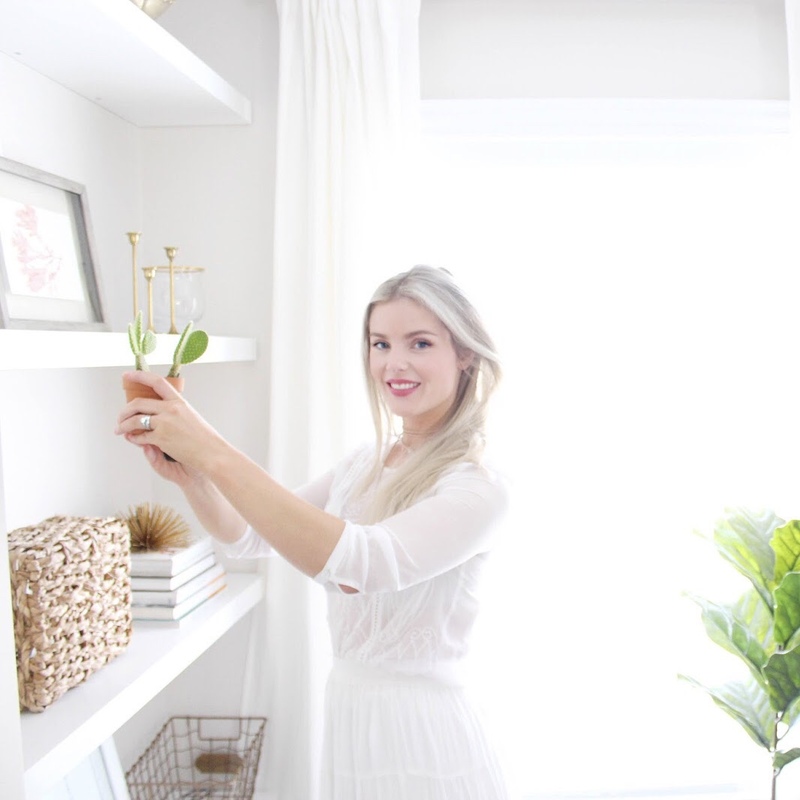 As silly as it sounds as a busy momma it's so nice having a warm meal amongst the chaos, it feels like I am doing a little something for myself. 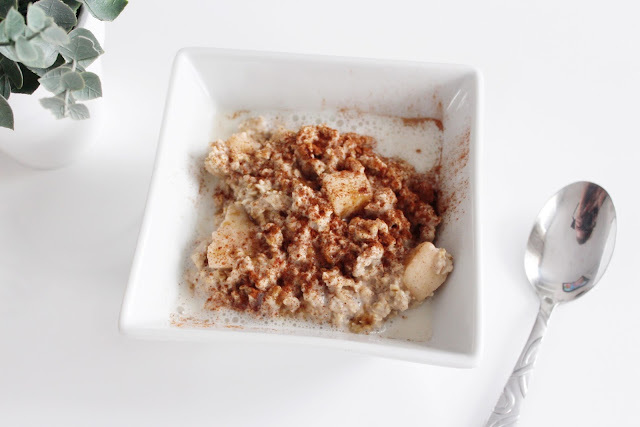 The almond milk makes the oats so creamy and when your ready to eat just pop them into a bowl and garnish it with whatever you like, I usually do some more almond milk on top and a bit of cinnamon! I hope you all have a great start to the week and give this yummy recipe a try!